Celebrity Resorts offer a great destination to spend holidays in an exotic fashion, at the centre of Mountain Village. The all-season hotel and accommodation facility has extensive arrangements for luxury and entertainment. 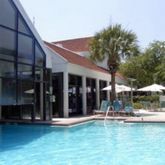 The resorts have the facility of tennis courts, patio areas, outdoor grilling, exercise rooms, vending and ice machines, mini golf course and even hot sauna tubs. In addition, the resort also has the facility of complimentary coffee and newspaper daily. The resorts have indoor heated pools, apart from elevated hot tubs associated with spectacular atrium view of gorgeous Mt. Werner. They offer their resort service throughout the day. There are currently 0 consumer reviews about Celebrity Resorts available. Share your review. Please take a note that you are about to post a public review about Celebrity Resorts corporate office on CorporateOffice.com. This review will be public, so please do not post any of your personal information on this website. If you would like to contact the corporate offices of Celebrity Resorts, please use their contact information such as their phone number, website, and address listed above to contact them. However, sometimes staff from Celebrity Resorts headquarters do read the reviews on this website.